Greenlee is proud to introduce the 701K-G6A, a fully upgraded version of their powerful Greenlee 701K industry standard professional Tone and Probe cable pair tracing kit. 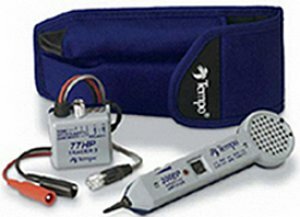 The 701K-G6A Tone and Probe kit offers superior tracing for low voltage applications such as telephone, data, and security alarm wiring. New - LED headlight for improved viewing in dark rooms, cabinets & man holes. New - Headset jack allows headphones to be used in noisy environments. New - Provides an audible and visual continuity tester for short circuit testing. New - Improved - DC input voltage protection. Included in the 701K-G6A kit is the 77HP-G6A (Alligator Clips) high power Tone Generator with short circuit checker, the 200EP-G Tone Tracing Probe, an RJ11/45 coupler, alternate flat/spade plastic and round metallic probe tips, and a durable nylon case.